Valet parking is available at Chops Lobster Bar. Chops Lobster Bar is a seafood and steak lover’s paradise. The mosaic-style dining room is the ideal setting to enjoy signature items like the Savannah Lump Crab Cocktail and Famous Jumbo Batter Fried Lobster Tail. Enjoy a cocktail before dinner or savor a glass of wine from the extensive list in Chops’ inviting bar. Proper dress is required. Crispy Maine Lobster B. L. T.
Chilean Sea Bass & Salmon "Hong Kong Style"
*these items are served raw or undercooked or contain raw or undercooked ingredients. consuming raw or undercooked meats, poultry, seafood, shellfish or eggs may increase your risk of food borne illness, especially if you have certain medical conditions. The food was very good as usual, and the service was outstanding. Can’t wait to visit again! Always enjoyable to dine at the Lobster Bar. The food and service are wonderful. The atmosphere is lovely and there is always a lot of activity. We love dining at the Lobster Bar. Service was good. I was super excited to spend my anniversary here. We had lobster, crab, and salmon. Only thing we enjoyed was the complementary cake. I would personally not eat here again or recommend no matter the price. Our server, Matthew was outstanding. He was there when we needed him & not when we didn’t. The mussels were out of this world. We will be back! I love this restaurant!!! The service is great and food is excellent! I’d recommend you to this restaurant to anyone that has an appetite for for good food! Chops Lobster Bar is one of our favorite places to eat in Atlanta. We try to go there every time were are at Buckhead. The service and food are excellent. Prom dinner. Food and service was absolutely great! Food and service Brilliant. The carpets and interior need a facelift. Too expensive for casual meal. Perfect for our special occasion. As always, the food and service were superb! You cannot beat the fried Lobster Tail and the Steaks were also amazing. The best staff in Atlanta, serving the best food in Atlanta. Always a great experience. We had the worst service I ever had at Chops. Such an incredibly disappointing meal ( actually I never actually got my entree) lol not joking so can not even call it a full meal! Will not go back. Chops / Lobster Bar is a favorite and has never disappointed me. I prefer the intimate, Parisian feel of Lobster Bar and enjoy how servers are attentive but don't hover. Steaks are (always) amazing and the onion rings are an unexpected and fun treat. Everything was INCREDIBLE!! I’m going back soon!! Had a great time with friends. The food was outstanding. Enjoyed a new Tequila as well!! From arrival to our service, to the wonderful food, everything was perfect. Thank you! Favorite restaurant. Consistently great food and service. Dover sole 80s style is perfect. Great crab cakes. We love the Lobster Bar. Always delicious! Very dark; originally given table near kitchen. Noisy and distracting. Asked to be moved and table location was much better!! Everything about Chops Lobster Bar made the night delightful. I had the filet, mac & cheese with smoked gouda, and creamed spinach. The steak was absolutely perfect, as was every thing we ate. The ambiance was intimate & romantic. The service was magnificent! I will definitely make Chops Lobster Bar a regular, delicious indulgence. 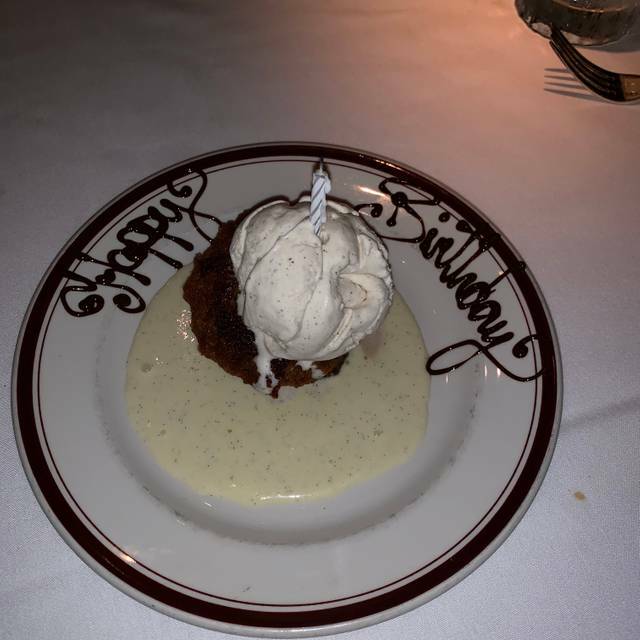 My husband and I were celebrating our 4-year Wedding Anniversary! Chops Steakhouse was where we had our 1st date so wanted to try the Chops Lobster Bar! The food, service, wine and atmosphere were impeccable. 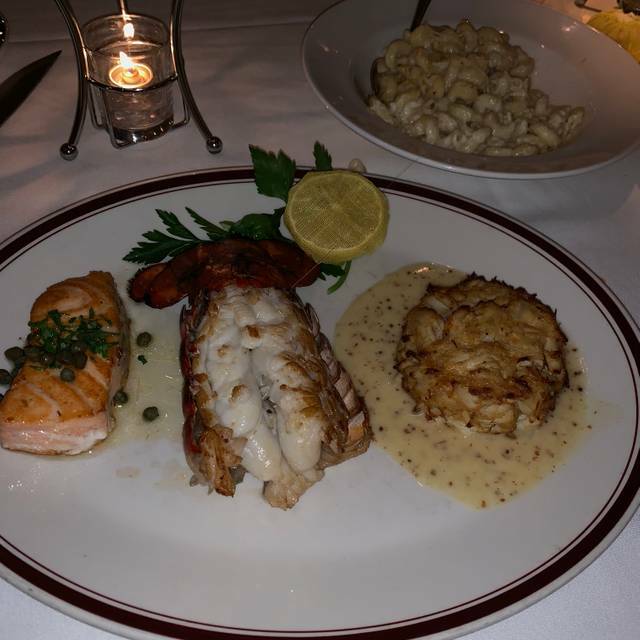 I had the halibut w/lobster special and my husband had the fillet. All we can say is Our choice selections were prepared to “perfection”. We finished our meal with two different desserts we shared. The evening celebration could not have been more perfect!!! Thank you, Chops, for making our special day even more special! What a wonderful meal. Lobster Bar is my favorite restaurant. I had Fried Lobster for an appetizer and the very delicious Crab Cakes for my entree. Their Crab Cakes have large pieces of crab and just about zero breading. So good! The service was exceptional. It was my husband's 92nd birthday and everyone made him feel very special. You cannot go wrong with Chops Lobster Bar. Consistently the best meal and service in town. Early reservation however they were not ready to seat us (which was fine so we went upstairs for a cocktail). Our server was excellent and attentive. My food (Signature Meal Lobster Tail) was good but side note my partners steak was excellent! Didn’t too much care for the award winning Banana Cream Pie (lacked sweetness and just wasn’t good). Nice evening overall. The service was very slow and not that friendly with 1 waiter for our table and no one assisting for drinks. I was there with 4 people. We weren’t asked for our drink order for 15 minutes. It took another 10 to bring us a drink and some bread as it was now close to 9 pm. It was so loud you could barely hear the person talking next to you and we couldn’t hear across the table. The food was average, everything came out in stages, the vegetables were brought out after the food was served. I ordered lobster and it was fair. I will not go back. Service was good but a little slow bringing our check after requesting it. Great experience and ambiance. Felt like we went back in time. Every attention to detail. My consistent business dinner go to. Perfection every time. Outstanding service, incredible meal. Steak was a bit over salted, but everything was cooked to perfection. Amazing atmosphere...always a buzz in the air...exciting place to dine and enjoy! We love Chops. We have outstanding steaks and service every time. The venue is beautiful as well. Please let me start by explaining that my line of work allows me the privilege of dinning in some of the best restaurants in the country and I have learned through the years what outstanding customer service is. My son and i were on vacation in Atlanta and since lobster is one of his favorite foods I booked this reservation based on that and on Open Table reviews. Chops Lobster Bar fell short at many small details and one major one. 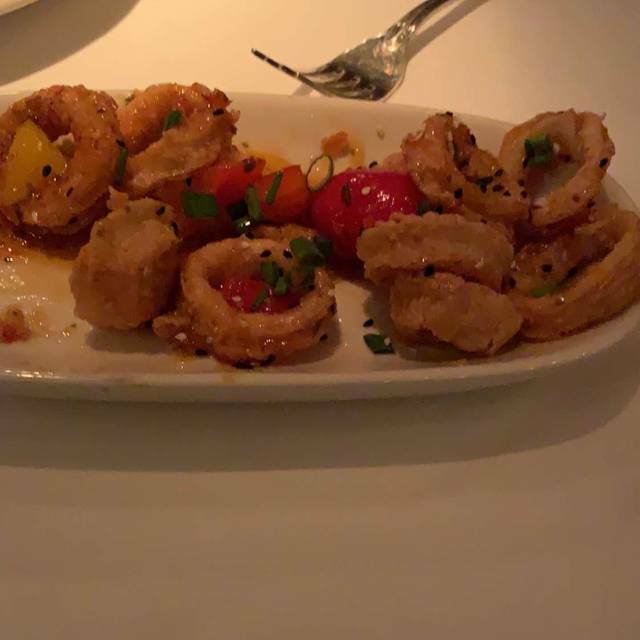 - I ordered the lamb medium and when I cut closer to the bone it was raw - no big deal happens to anyone- I mentioned this to server and he apologized and took my plate back to the kitchen, so far nothing out of the ordinary in the level of service of a restaurant of this caliber. My surprise came when I received the lamb again and it was the exact same pieces I had sent back but this time charred in the outside, inside was medium well not medium. Receiving the food you just sent back is something I would expect from a chain restaurant not from a place that charges min $50 a plate. I did get asked if everything was ok but at that point I didn’t even feel like bothering to be honest. We were excited to eat at Chops because it has a tremendous reputation in town. I wasn’t blown away by anything, but it was a good meal. SERVICE: We showed up on-time for our reservation, and were met with a nice greeting from the restaurant manager at the hostess desk, but awkwardly, there was some delay being seated because the young hostess interrupted the gentleman trying to seat us, so the two discussed an unrelated reservation while we stood around waiting to be seated. The server did a decent job. My date and I realized we got an abbreviated intro from the server and I wish we’d have known about some of the features and things we heard being mentioned by our server to the tables around us. FOOD: my salad and steak was great. The only food disappointment of the night was the Smoked Gouda Mac and Cheese- I found it to be runny and unremarkable, with no depth of flavor. The bread assortment was well-done and tasty. Love the fried lobster. The absolute best. And our waiter was a great guy.